Whether it’s an office, school or apartment building, secure access control is a concern for everyone. For property owners, the responsibility of keeping residents and property safe from criminals is a top priority. Surprisingly, most burglars choose the most obvious and simple ways to break in. The most common time for a break in to happen is between 10 am and 3 pm and they usually go right through the front door. If they are bold enough to do that in broad daylight, they probably have no reservations about sneaking through the gate of a complex. The main access to your property is often the first point of entry for unauthorized persons. Unfortunately, residents usually let them in unknowingly. You may have experienced this scenario yourself. You pull up to the closed gate of your complex. Motion sensors detect the movement of your car and slowly slide open. It then senses another car behind you and remains open, letting them in as well. With no controlled access, the gate is effectively useless for security purposes. Controlled and monitored access ensures only residents and authorized personnel enter your property. Coded entry gives residents a sense of security while providing ease of entry when the gates are programmed to open only for personal codes. But after access is granted, it’s also important that only those with the proper access enter. Monitored entry via integrated video systems ensures only the person with the correct credentials enters. After that, gates close on a timer that prevents another vehicle from entering. What if an unwanted guest gets in another way? 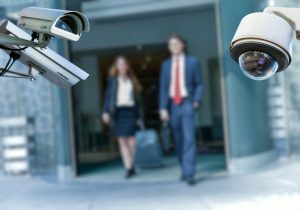 In addition to video monitoring of your grounds, guarding the entry to the inside of buildings with coded access or even fingerprint access will deter even the boldest of criminals. As a bonus, it’s a cool and easy way for residents to access their homes. Providing a safe living environment for tenants requires an investment of funds as well as time. Which is why many facilities managers have to weigh security against other maintenance issues. Choosing a company that can offer affordable solutions with a variety of options can ease those concerns. Coding and monitoring services from a reputable security company reduce the time and aggravation it takes reprogramming codes for tenants and walking the grounds. A variety of security features and online surveillance are a great approach to security for your property that will leave both you and your tenants feeling secure.